Racers and fans up north got another chance to escape the long off season this weekend with the third and final major racing show of the winter in New England. After shows in Augusta and Portland, Maine over the past few months, this weekend’s focus was on Racearama in West Springfield, Massachusetts. 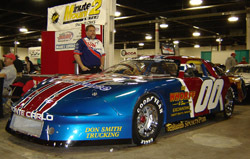 The show is the largest of the three and features a diverse mix of drivers and cars from various forms of Northeastern racing. For many, going to the show is an annual happening. There was plenty to see at the show. Just about every track in the region had a display and touring series cars were sprinkled throughout the show. NASCAR Modified fans got to meet Tony Hirschman, Jerry Marquis, Donny Lia and Ken Barry. Busch North fans could get up close to Eddie MacDonald, Dale Quarterley or Charles Lewandoski among others. The PASS Pro Stocks had Johnny Clark, Mike Rowe and Cassius Clark in the house and the ACT Late Models had their flag carried by Joey Polewarczyk, Jr. and David Avery. Even New England’s busiest racer, Ted Christopher, was spotted at the show as a spectator on Saturday afternoon. Part of the allure of the cars at the show is that they are all neatly painted up and lettered, without racing doughnuts on the side or scuff marks. Many teams even go one better and really put out all of the stops when it comes to getting ready for the fans. Maine’s Whorff Racing team fields Pro Stocks for brothers Bill, Jr. and Jeremie. They’ve won the best appearing car award in their class for two years running and had two neatly lettered and painted cars at the show. But it was the wilder paint scheme of Jeremie’s car that really turned heads. Since Lewandoski is moving up to Busch North this year, he was able to have another purpose at the show. Speed51.com will have a photo gallery from Racearama coming later this week. 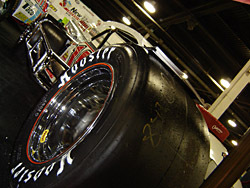 Stay tuned for more photos of 2005 racecars before they hit the track in the new season. In the NHIS display, Charles Lewandoski's #01 Busch North car shared booth space with the #00 Modified that Steve Park drove in September. The team recently raced at New Smyrna Speedway as part of Florida Speedweeks, so they didn’t have much time to get ready for the show. Also turning heads was the polished chrome on Donny Lia’s NASCAR Whelen Modified. The #18 car won the best appearing open wheel car honors for the show. Meeting up with racing people at a time of the year when competitors aren’t at the track every week was a benefit to the show. The paint was fresh on Jeremie Whorff's #00 car.